Two weeks ago, I found out that I was planning a local event at Kilbunny woods in Portlaw. The preliminary visit threw up some interesting changes to the map. Considerable forest clearance, new tracks formed and old tracks partially blocked. Panic....four hours of noting changes on an old map. More time updating the map on the computer using OCAD (Orienteering Computer Aided Design). Back out to the forest to check the changes and plan the four colour coded courses. Another three hours in the forest clearing the brambles from usable tracks. On the way back from the forest saw a sign that there was to be a sponsored horse ride in the Portlaw woods on Sunday 25th, the original date for the event. Managed to agree a change to the Bank Holiday Monday. Put out some of the controls on Friday, feeling reasonably happy that everything is in hand. Left home on Monday morning at 8.30. Put out the directional roadsigns. Arrived at the barrier, at least it was not locked! 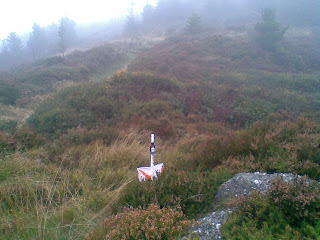 Drove out the the furthest point to find a happy forester clear felling an area of forest that contained two controls! Help! Had to do some last minutes rejigging of courses and map changes. 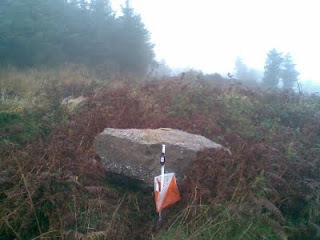 Why do Coillte never tell you what they are doing when you pay the user licence fee? People started to arrive, starting to get a little drizzly...loads of people arrive...starting to rain and get very misty. first Blue course competitor returns...control missing...kite and post still there on the ground, SI unit missing. Nothing I can do, only on Blue course in an area with almost no through traffic...maybe a horse ate it the previous day? 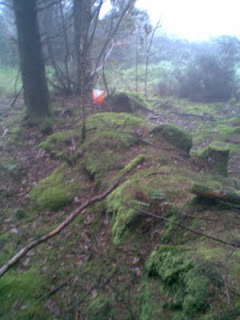 Green and red course competitors return with tales of difficulty finding a boulder near the top of the far ridge. Maybe the additional extraction rides were confusing and should have put a control on the end of the path...I put the control out that morning in the opposite direction, coming down off the hill. Start to run out of red course maps...manage to recycle a few at the end....never know how many to print! Download problems...computer starts to decide it is not going to recognise the Com Port...cannot download information from SI cards...at the last minute it decides to work...phew! Despite the long course times, the climb were to blame, most competitors finished their respective courses and there was no complaint of any controls in the wrong place just some grumbles about mapping standards. The weather turned rather damp and misty so early entrants had an advantage. Full results are up on the IOA website. Current standings after 3 South east league events can also be found here. A big thanks to Angela and Jana Cox for all their hard work on the start, upload and download. From a learning perspective, this weeks chosen control sites (excuse the quality of the pix, it was getting dark when I was taking them in) are displayed below. that darned boulder! 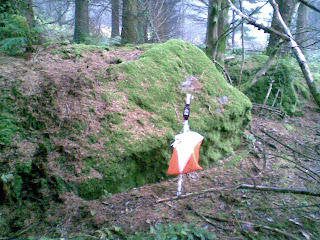 a crag deep in the forest the selected earthbank or is it a ruined stonewall from when this was agricultural land? 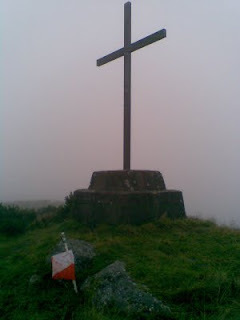 Just how misty it became...so much for the spectacular views of the river Suir and the Comergh mountains!